I was heading into outer Colchester now, but even so the combined village of Langenhoe and Abberton still felt very rural. 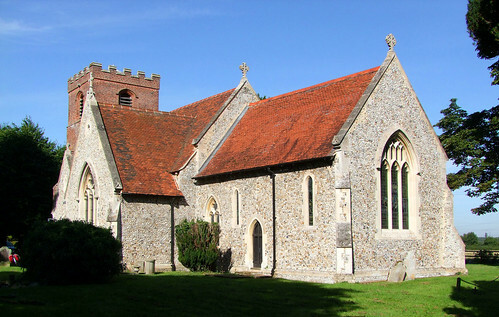 Langenhoe's church was flattened in the 1884 earthquake and rebuilt, but the Victorian church was in turn demolished in the 1960s. It is thus one of very few parishes of all the hundreds in Essex which does not have an entry in the revised BoE. The Abberton end of the village is smaller, and out beyond it a tiny lane leads out through woods towards its church. Open. You have to walk the last 100 yards or so, and there it is, a stunning sight, a tiny little red brick church on a steep bluff dropping towards the Abberton Reservoir, a vast expanse of water stretching several miles in each direction. There is not a single other building in sight, just bulldozers and cranes working far below to complete the banks of the still unfinished reservoir. It was a bit like being in a James Bond movie, looking down on something the Russians were up to. The tiny church is completely unpretentious and very welcoming - it is obviously open all the time. A white interior, a few memorials, a delightful sense of fifty years ago. It was a perfect place to finish, but, as I had to get back into Colchester I did so via a revisit to an old favourite, Fingringhoe.